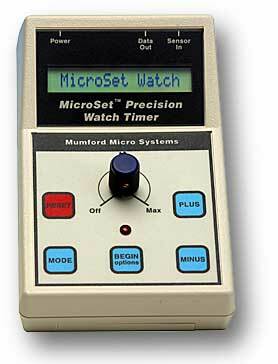 The MicroSet Watch Timer Pro is an enhanced version of the MicroSet Watch Timer with improved features and the most commonly requested options. It includes the clamping watch sensor, the built-in beat amplifier, the balance wheel amplitude option, and an ehanced version of the Windows Interface Software for the Watch Timer Pro. The Pro software allows the computer to control the timer. You can select a function from the Windows screen and the Watch Timer Pro will be automatically reconfigured for that function. The included software will also measure Accutron watches and simulate paper tape watch timing machines. 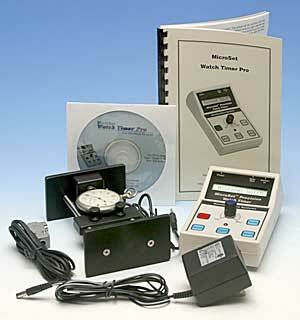 Click here to see how the Watch Timer Pro differs from the MicroSet Watch Timer. Beat Error Mode measures the difference between even and odd ticks in tenths of a millisecond. Display results in Seconds Per Beat, Beats Per Hour, or Error Per Day of any watch (is not limited to a programmed set of train times). Automatically detects the most common watch rates. The Running Average function will display the accumulated overall rate of any watch, becoming more accurate the longer it runs. 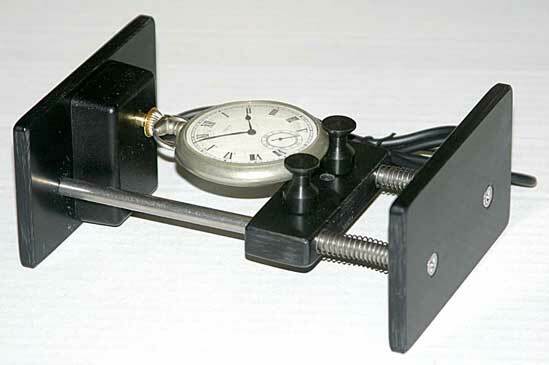 Balance Wheel Amplitude A high resolution graphical display of watch ticks and balance wheel amplitude with the Windows Interface Program. "Paper tape" display mode emulates a paper tape watch timing machine with the Windows Interface Program.